Is there a distinctive pattern on lumber that has been cut this way? I’ve been studying some old houses that I believe have site-milled lumber and I’m wondering how to verify how it was cut. There will be score marks on the lumber. An Up and Down mill will leave similar marks. A couple ways to tell them apart is that the up and down mill will have score marks closer together and pretty much straight down through the lumber and fairly parallel to each other. A pit saw will have coarser marks, not all of them paralell to each other and at an angle (about 15 or a little more degrees from being straight through). And of course, a circular mill left circular score marks…but on smaller lumber cut on a large blade, the score marks can appear to emulate either type of saw. The larger the diameter of the blade, the less an arc appears in the score marks. Also, it matters where the cant was when they began slabbing the log. Lower down meant the score marks are more vertical than up higher. Sometimes you need to look on more than one side to see the arc. Mikes description is right on. Here is a graphic. Okay, thanks Mike – and Stephen. If you know were I could get a pit saw I’d sure like to know!!! I don’t know currently if they are available, there are a couple of saw makers talking about making them. So they may become available again, or maybe they are still available somewhere. Good Luck, I will look around myself. I have pretty much the same question as Joe Cottonwood, since I live in a 1773 post-and-beam in VT (gloat) we recently had renovated, regarding how to tell up-and-down water-power saw cuts from pit-sawn. I haven’t made a real close study of it, but so far all I’ve seen on original boards here, almost all of which are pine, meet the description you’ve offered for mechanical vs. pit-saw pretty well, namely the marks are vertical and consistently parallel to each other. However, I do see widely varying spaces between them, ranging say from 3/8″ to 1/2″ in close proximity on the same board. I attribute that variance to balky-ness in the mechanism that fed the log into the blade, or in the apprentices that did the feeding if that’s how it was done, but what do I know about it really? Not much. At least it’s easy to discern which were cut on circular saws by the curve of the marks, even on narrowish boards cut with huge blades, which would date materials to about 1840+ I believe. Such are mixed in here and there where renovations were undertaken in the 19th century. And to my eye at least I don’t see signs of band saw cuts at all, which I would think would not leave such definite and distinct saw marks since there would have been no up and down, stop and start cycle, but again, what do I know? The thing I’m most puzzled by is why there’s so much shagginess to the surface of the 18th century period boards, the same surfaces that also show the straight saw cuts as described, but not on all such boards either. It looks kind of like they were run through a primitive planer in a wicked hurry, and it could be one of those was available at the same mill nearby I surmise, but I don’t see the usual telltale planer marks at all. Of course, where the boards were finished on one side for paneling, there’s good evidence of hand-planing, but the shagginess I’m referring to is not at all like that. I’ve never used a scrub plane, but I would think that would leave marks more like a spoon leaves when dragged across ice cream, as I do see here and there where things were clearly hand planed. Do the huge teeth, when combined with a rapid feed rate on up and down saws, perhaps especially when dull, leave such shaggy surfaces, almost as if it were riving almost as much as cutting? I would welcome any comments on this ranging from definite knowledge to rank speculation. Thanks for your comments and I will try and I will try and address your questions. It is not unusual to see boards cut on an up down saw and the edges dressed with a circular saw, a function that it does well. The roughness and unevenness can be a result of the particular log, the dullness of the teeth and the moisture content of the wood, but almost all wood was cut green. 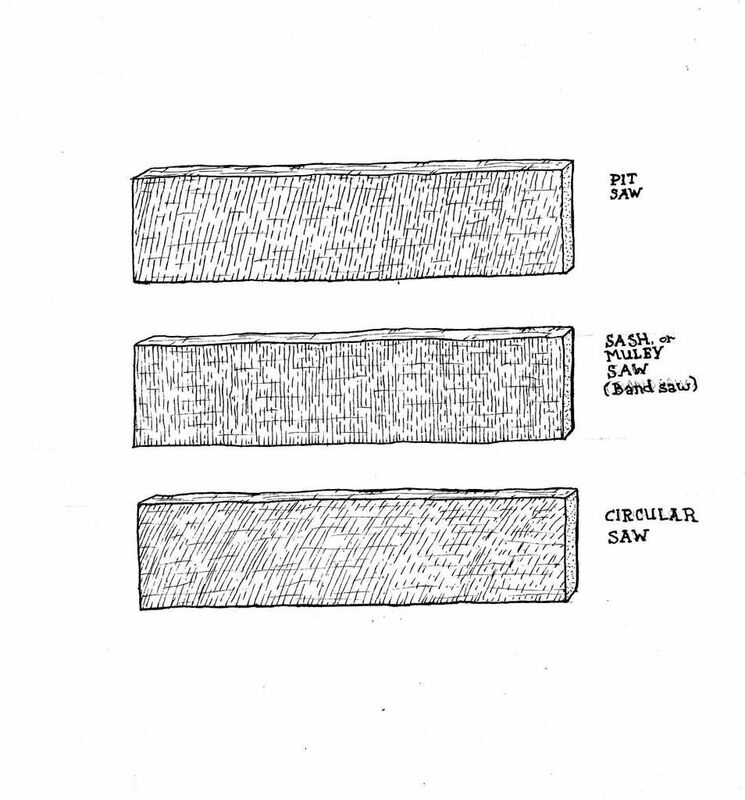 The unevenness that may look like planer marks may be shrinkage during drying and seasoning over the years. The carriage that holds and moves the log is generally operated by a rack gear mechanism, some had weight driven carriages, which would produce irregular marks, whereas the gear mechanism the spacing is much more uniform. Maybe others will add their comments. A couple of years ago I tracked down a company in India that still made a variety of sizes and toothings of pitsaws. The only problem was they couldn’t ship a small order to the USA. I’d have to find an agent in India to get one or two from the factory and ship it. I was thinking one for hardwood and one for pine. I also tried to make a frame pitsaw using big bandsaw blades. The high-hook teeth were too aggressive for human power when I tested them in a temporary set up. I may still re-grind the teeth and try again. Thanks for the comment, I will have to look into the India source as I would like to get a pit saw myself, and I don’t know why? 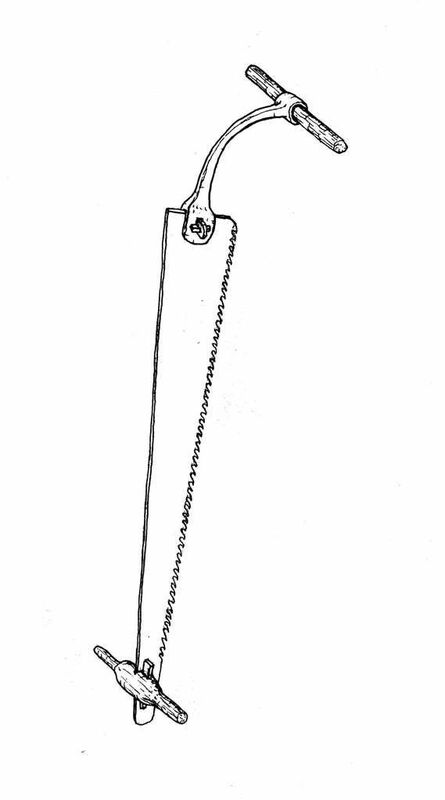 As for the big bandsaw blade and the high hook tooth not being able to use human power to operate could also be a result of lack of weight in the frame. Also pit saws, open or framed were used for cutting green unseasoned logs, which cut much easier than dried and seasoned wood. I live near a hardware store that has that saw almost exactly. its on display. they won’t tell me how much the want for it. Its a Disston. I’d love to find one like it somewhere, but all my searching hasn’t turned one up so far. Welcome and good luck in your search. If you find one or more let me know. I have just received my pit saw, box and tiller from Frog tools http://www.frogwoodtools.com/ and it is likely the same saw described in this article. The saw will be found by clicking on the link in the side bar for log and timber framing tools. It was $300.00 even including shipping. the blade is made in Germany and although the tiller and box are nothing like the examples I have been fortunate enough to see in use at colonial Williamsburg, a recreation of such examples should be easily within the reach of the average metal smith. I intend to use it when re sawing is not an option with my 20 inch band saw and to produce lumber for more historic work. another option I had in mind (if you have a lot of time on your hands or are a saw sharpener) was to reshape the teeth and gullets on an old crosscut saw and make a tiller and box for it. This blade looks great although it is not properly sharpened and bears a logo of 3 crowns with the words “cast steel made in Germany” dose any one know what company this is? The man at Frog Tools did not know and I assume this saw may have been siting around frog tools storage facility for some time by the looks of the bird crap on the box. I didn’t know Frog Tool Company was still in business! I have no idea who the maker is, but someone else may know. Good luck with your handles.